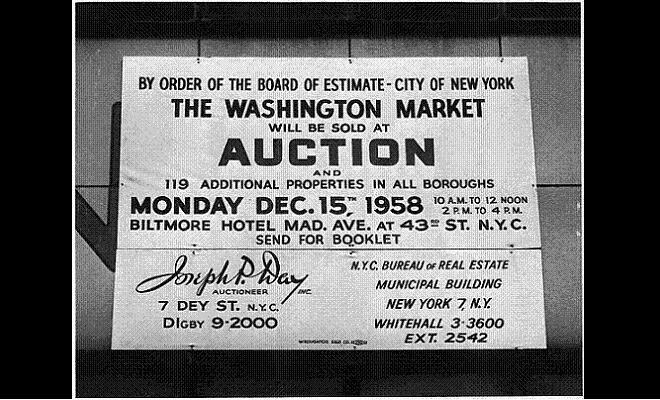 The images at the bottom of the post charts the rise and fall of the Washington Market, from its earliest days to its destruction in 1960. The sun has barely risen, but the horses and delivery wagons forming a steady stream from Dey to Canal Streets since nightfall have to share the road again. Rats scurry back into the maze of wooden sheds with their vegetable scraps as an early-to-rise New Yorker walks briskly down Washington Street, market bag in hand. He wants to be sure to get the day's choicest fish, to be glimpsed jumping in their tanks. Not far behind him is a housewife, coming to the market for some young turkeys, chickens, and ducks. She places these in the basket her servant carries alongside her, next to the butter which has a separate tin cover. Soon the market is in full swing, with vendors prominently shouting out the fresh spinach and kale from New Jersey, bundles of rhubarb and asparagus from Long Island, and baskets of strawberries from the Carolinas. 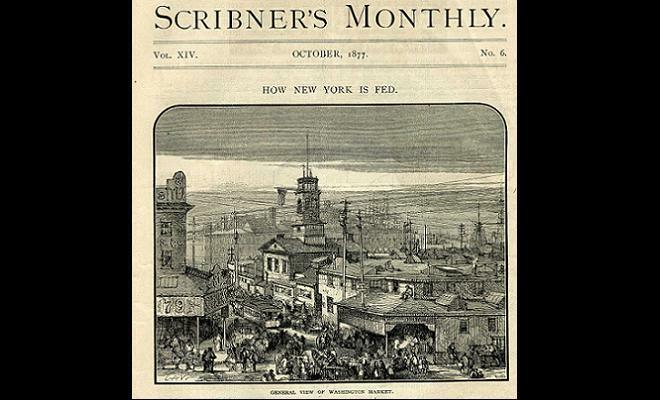 Such was the scene in the Tribeca of 19th century in downtown Manhattan. Commerce of a different sort continues in this neighborhood of the 21st century. 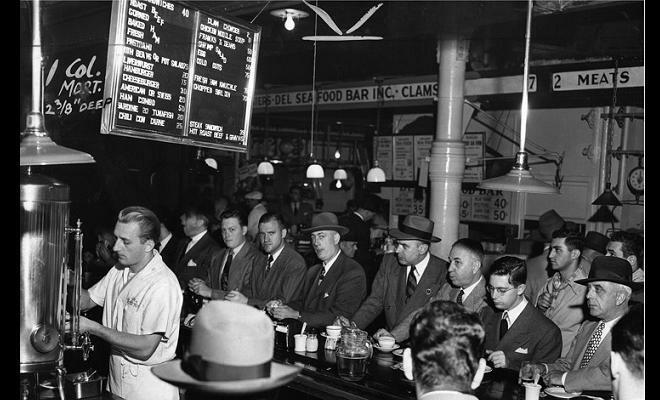 New Yorkers walking into the tony enclave's restaurants, art galleries, Duane Reades, and Starbucks cafes, who today look up and see One World Trade Center rising overhead, are probably unaware that an enormous food hub called Washington Market used to make its home here. 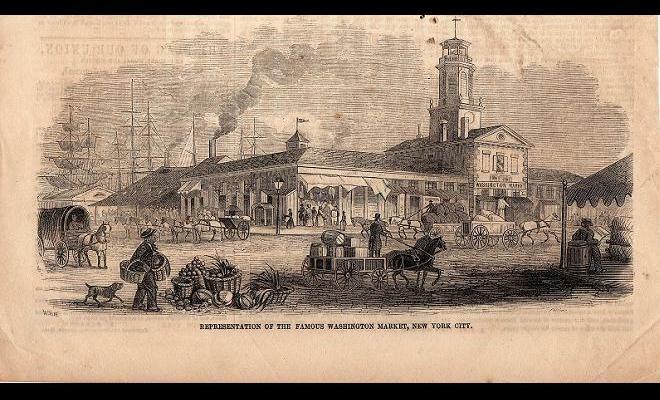 Washington Market, a piece of forgotten New York history, would have celebrated its 200th anniversary this year. 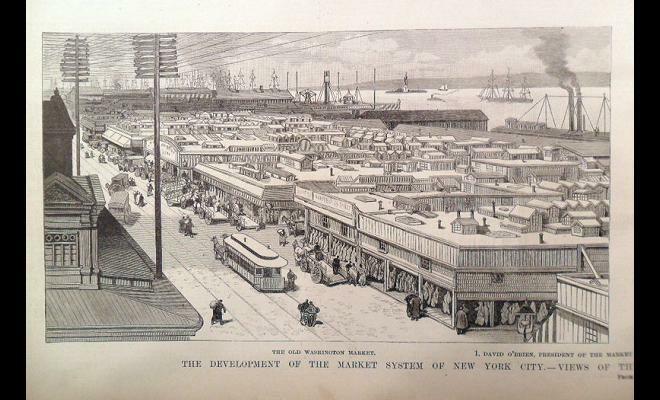 The market got its start in 1812, and operated until the 1960s when it gave way to redevelopment, including the site that was to become the World Trade Center. 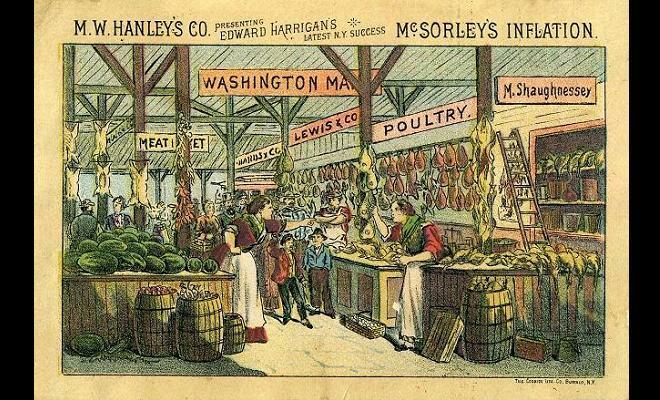 With many of today's cities experiencing a market renaissance, the rise and fall of the historic Washington Market offers both inspiration and wisdom for sustaining the growth of today's farmers markets. 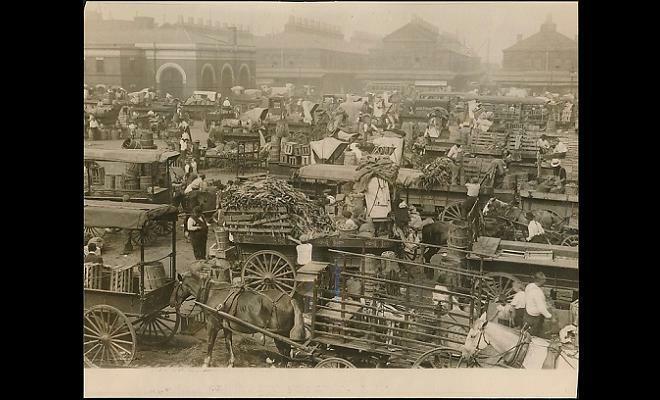 By the 1880s, there were more than 500 vendor stands and over 4,000 farmers' wagons driving into the city daily to sell. 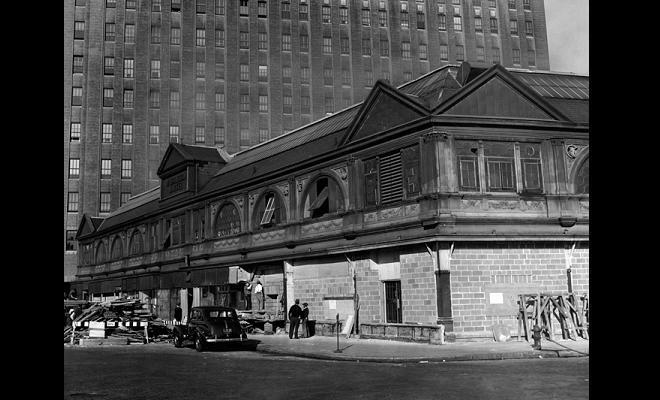 With the growing complexity of its operations and evolution into a regional food distribution hub, New York City's Office of Public Markets stepped in to regulate the competitive relations between farmers, wholesalers, and consumers. The office took responsibility for such things as public health and safety, traffic regulations, and weights and measurement standards. 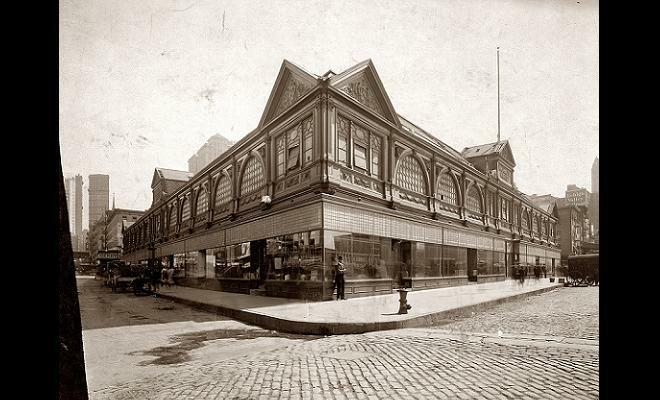 Although this specialized city bureau no longer exists, it underlines the vital role markets played in civic life. Cities today are seeing a markets make a comeback, as communities and civic leaders aim to tap into markets' magnetic ability to attract people and bolster surrounding businesses while improving fresh food access. In 2000, there were about 2,800 farmers markets operating in the United States--a number that has now grown to over 7,000. From New York on one coast to Portland on the other, many American cities are seeing their market networks mature and thrive. The Santa Monica Farmers Market, successfully operating for over 30 years, is one of the pioneers of this new wave. 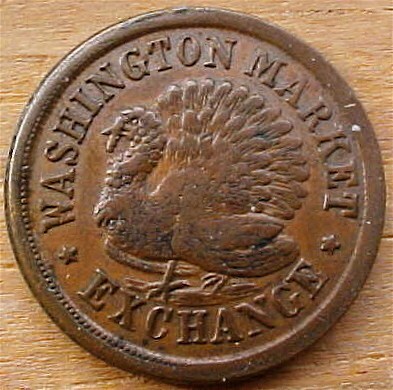 Like Washington Market, it started out small and then expanded its network to encompass the four weekly markets currently operating. 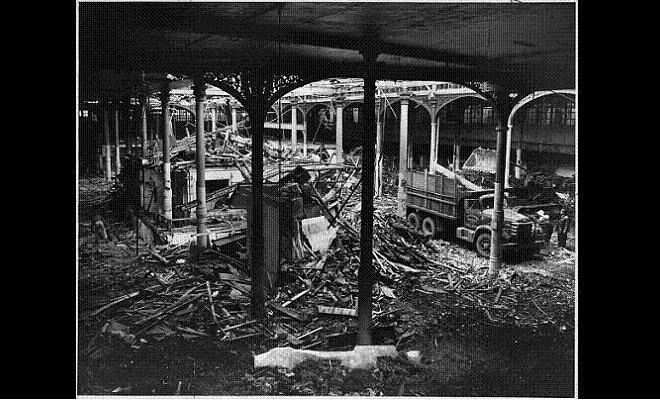 Likewise market halls, once the cornerstone of community planning, are re-surging in cities large and small. In 2014, Boston Public Market anticipates moving into Parcel 7, the site of its new home with 30,000 square feet of ground floor retail space. Just last month, the community of New Bohemia in Cedar Rapids, Iowa passed a milestone with the opening of NewBo City Market. With this new market building, the community reclaims back stronger than ever a flood-ravaged industrial site. In addition to vendors taking stalls inside the market building, some will choose to open a permanent storefront facing the market or nearby. 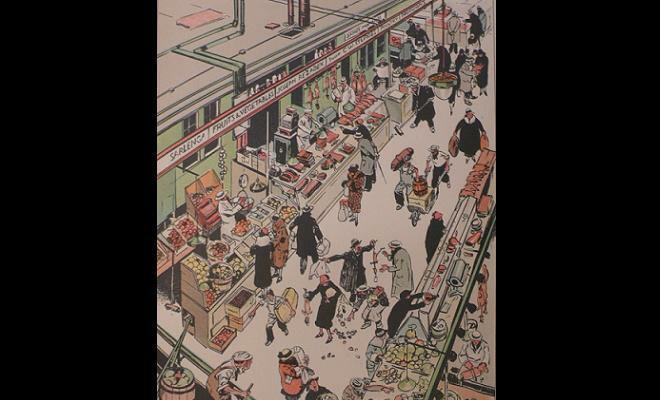 A market district is in the making when people, not necessarily market vendors themselves, see markets as an opportunity to start a business because of the clustering of food uses and foot traffic. Through communities’ diligence, safeguarding, and adaptability, many of the new farmers markets coming to life today will grow and last for as long, if not longer, than the historic Washington Market. 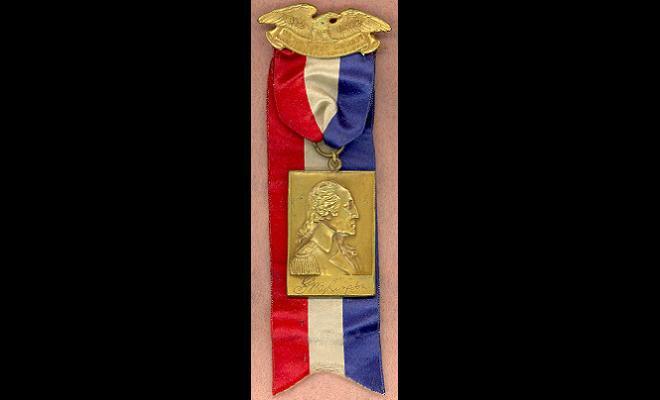 All images appear courtesy of David K. O'Neil.